Hello again, it’s Don Milne to guide you on Roadtrip-'62 ™ as we begin our twenty-third day of travel along historic US-6. Yesterday, we traveled from Iowa City, Iowa to Des Moines, Iowa, seeing the sights of the Amana Colonies, the history of Maytag appliances, and plenty of corn fields in the 114 miles we drove. Today we will drive around Des Moines, Iowa, the state’s capital. It’s a big city, so that means museums and architecture, of course, but also an amusement park and a few surprises. As always, if you see anything you like, get yourself out on the road and enjoy it in person. You might be having fun on this virtual roadtrip, I know I am, but there's nothing like the real thing! At any time, click on an underlined word below to learn more about the places on the trip. Let’s get back on the road again! Last night, I stayed downtown at the Hotel Fort Des Moines. As I mentioned yesterday, this eleven story hotel is known as "Iowa's Landmark Hotel” and has hosted presidential candidates, movie stars, and more since opening in 1919. 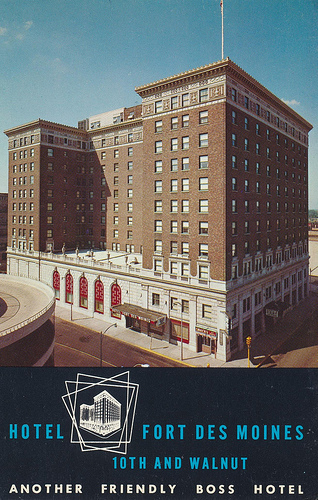 The three original promoters of the hotel were all local Des Moines businessmen, one of whom was Edwin Thomas Meredith, the founder of Better Homes and Gardens magazine and the media company, Meredith Corporation. One thing about staying in a large hotel is that breakfast is close at hand: I could spring for room service if I wanted to! Instead, I’ll head downstairs to Alexander's Coffee Shop, where there is a daily breakfast buffet. Des Moines is the capital and the most populous city of Iowa. As such, it has always had a busy downtown. One of the city’s major businesses has been financial services. Though we saw evidence that Hartford, Connecticut could claim the title when we drove through that city on US-6, a Business Wire article has credited Des Moines as the "number one spot for U.S. insurance companies". As we drive around, you can easily see why. Des Moines is the headquarters for the Principal Financial Group, Athene USA insurance, EMC Insurance Companies, Allied Insurance, American Republic Insurance Company, and Wellmark Blue Cross Blue Shield. Quite a roster! Because of this activity, some of the headquarters buildings are much newer than what we would have seen in 1962. Beginning around 1980, the skyline of Des Moines added several new skyscrapers. Before then, the 19-story Equitable Building, built in 1924, was the tallest building in the city and actually the tallest building in Iowa. Now the skyscrapers reach to 45 stories! There are a lot of places in Des Moines that are too new for our 1962 trip, because the city has had a kind of renaissance since reaching a post-industrial low around 1980. The Science Center of Iowa opened its doors in 1970, the Greater Des Moines Botanical Garden opened in 1979, and the Heritage Carousel started going in circles in 1998. The carousel appears to be a late 1890s ride, but it is really a modern, hand-carved, hand-painted, basswood replica. It’s located in Union Park, one of the largest parks in Des Moines. Another large park is Blank Park, where the zoo is located. The Blank Park Zoo only opened in 1966, after five years of planning that began when the federal government offered to donate the former Fort Des Moines property to the City for recreational purposes. As with many zoos of the era, it was designed around nursery-rhyme themes and included a miniature train. We might have stopped in to the Iowa State Education Association, but I doubt it. Back in 1962 they occupied the current Salisbury House and Gardens, a beautiful 42-room mansion built in the 1920s. The Education Association was in the home from 1954-1998, when it became a museum. Fortunately, the collections of art, tapestries, rare books, and antique furnishings from around the world were intact, and we can see them today. One final thing we could not have done in Des Moines during 1962, but can today, is see a minor league baseball game. Though professional baseball began here in 1887, the changing string of teams ended with the Iowa Demons folding at the end of the 1961 season. There was still a stadium; the former Pioneer Memorial Stadium was renamed for long-time Des Moines Register sports editor Sec Taylor in 1959. A new team, the Iowa Oaks, was fielded in 1969 and today the Iowa Cubs are the Triple-A affiliate of the Chicago Cubs, playing in the Pacific Coast League. Our first stop of the day is the Des Moines Art Center. In addition to a great collection of art, the building is also noteworthy. It was designed and built in stages over the years by three of the great architects of the 20th century: Eliel Saarinen, I. M. Pei, and Richard Meier. The original building was designed by Saarinen beginning in 1945 and opened three years later. The Des Moines Association of Fine Arts had operated out of the main library building for many years, but was given a trust from the will of James D. Edmundson in 1933. He wisely stipulated that the money must be held for 10 years, in the hope that it would grow once the Great Depression was over. Thus the Fine Arts Association began planning for a new building in 1943. Saarinen’s recent award-winning design for the Smithsonian Institute Art Gallery had attracted local attention in 1939 and the Art Center included elements from that design. The accepted design was a distinctly modern building with a horizontal profile and flat roof that snuggled into the natural setting of the city’s Greenwood Park. It’s Lannon stone cladding is consistent with stone pylons that were already in the gardens behind the Art Center site. In a Roadtrip-62 ™ coincidence, Eliel Saarinen also designed a building on our first route. In collaboration with his son, Eero Saarinen, he designed the small Community Center in Fenton, Michigan, on old US-23. The 1968 addition to the Des Moines Art Center was the work of I. M. Pei. It’s a very different style and exterior material, using bushhammered concrete, and was designed not to obstruct view of the original building. Richard Meier supplied the final addition in 1985. He chose porcelain and granite for the addition, resulting in a unique architectural achievement. Under it all, the original building is nearly intact. The Des Moines Art Center has a permanent collection of 20th- and 21st-century works of both modern and contemporary art. There are also examples of other styles and cultures including the Renaissance, Impressionism, and 18th- and 19th-century Japanese woodblock prints. There are over 4,800 works art altogether, so this will take awhile to enjoy. The Art Center also hosts an Art in the Park event on the grounds of the museum in Western Gateway Park each June. The festival traces its beginnings to 1958 when only a few hundred people attended. It’s now the major festival in Des Moines, with annual attendance exceeding 200,000 people. While we’re at the Art Center, let’s stroll out the back and see the Clare & Miles Mills Rose Garden. The garden has been around since the early 1930s and displays hundreds of different roses. It is an All-American Rose Selection Public Display Garden. The views are also enhanced by the background plantings of shrub roses, climbing roses, lilacs, and evergreens. Farther out back is Ashworth Park with its Bill Riley Recreational Trail trail, which heads down a ravine or two towards the Raccoon River. Well, the Art Center used most of our morning, so just let’s drive around a bit and see some more sites before lunch. I mentioned large parks a moment ago, and there are several others in Des Moines, including scenic parks along both the Des Moines River and Raccoon River. Gray’s Lake Park is one of these, but was not opened until 2001. We would have seen mostly a very large gravel pit, with a Holiday Inn at the southwest corner, back in 1962. The motel is gone so we cannot stay tonight. 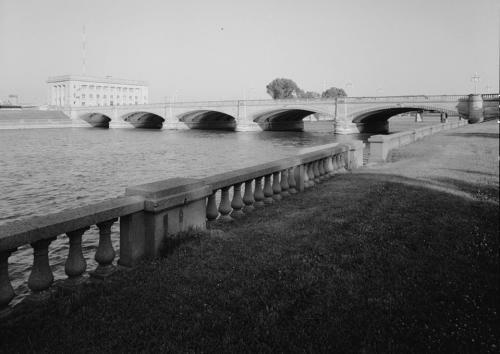 The Principal Riverwalk, downtown on the Des Moines River and Raccoon River, still features some of the ornate riverfront balustrades built by the federal Civilian Conservation Corps in the mid-1930s. Unfortunately, the ornamental fountains that were part of that project and once stood along the riverbank were buried in the 1950s, so we could not have seen those. However, we can see some beautiful bridges over the Des Moines River that have been here a very long time. There are four bridges in a short distance downtown: one every block. Starting at the south, the Court Avenue Bridge is a concrete-filled spandrel arch bridge constructed in 1916. The arches have never needed reconstruction and are still structurally sound. Today the bridge presents an unusual feature in that angle parking is allowed on the bridge. I guess Des Moines needs the parking more than they need the bridge for travel. It’s not unusual for downtowns to have significantly less traffic than in the 1960s due to ring freeway systems and suburban growth. The next bridge north is on Walnut Street and is a similarly beautiful arch bridge. It was built in 1911 and also allows parking on the span. Looking north we see the Locust Street Bridge, built in 1909 and so similar to Walnut Street that it’s hard to tell them apart. The last bridge in this series is the Grand Avenue, which dates to 1918. While it is also a concrete arch bridge, it has not lasted as well as the others and is scheduled to be replaced in 2015. When built, the Grand Avenue and Court Avenue Bridges stirred a controversy, because they were designed differently by different engineers. Apparently, Des Moines would have been better off to build both from the longer-lasting Court Avenue plans. At the west end of Court Street is the scenic Polk County Courthouse. The courthouse was built about the same time as the four nearby bridges, in 1906, and the style fits well with the bridges. It was designed by the Des Moines architectural firm of Proudfoot & Bird, which also designed the Jasper County Courthouse that we saw yesterday and the Hotel Fort Des Moines, where we stayed last night. The French Way Cleaners is another great piece of architecture from the same period, built in 1916. Normally, a simple brick building for such an industrial use would not be impressive, but the French Way building has some amazing sculpted figures with trumpets at the top. The building is still used for its original purpose as a dry cleaners! Let’s end this architectural drive at Iowa's Governor's Mansion, Terrace Hill, which lies just west of downtown on Grand Avenue. Unfortunately for us, this opulent example of American Victorian Second Empire architecture was not open to the public in 1962, so we should spend our time outside. But the home is situated on 8½ acres on Des Moines’s highest hill, and therefore provides great views of the city. The 18,000 square foot mansion was built in 1869 by Benjamin F. Allen, Iowa’s first millionaire. Mr. Allen made his money mostly in banking and real estate in Nebraska and Iowa before and during the Panic of 1857. He went bankrupt and sold the property to Frederick Hubbell in 1884, whose youngest child then lived there until 1956. I’m not certain if the home was vacant or lived in by short-term tenants after that, but the Hubbell family offered the home to the State of Iowa as a residence for the Governor and his family in 1971. As Iowa owned only a smaller colonial style home for the governor, which was ill-suited to hosting dignitaries and events, the state accepted. After some work, in 1976 the first Governor to use Terrace Hill as his residence moved in. Guided tours of the mansion are now given so the public can view the public areas, which showcase works of art, stained-glass windows, crystal chandeliers, historical artifacts, and antiques. Time for lunch; let’s find something from 1962. 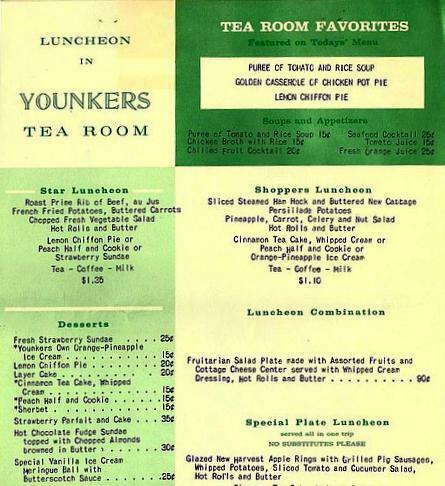 We could have stopped at the locally-famous Younkers Store Tea Room back then, but it’s gone now. Younkers was a department store downtown, which may seem to be an odd place for lunch. But their 5th floor Tea Room was a favorite place to be from the 1920s until it’s closing in 2005, hosting the local who’s who along with shoppers. Younkers was founded by three Younker brothers as a general store in Keokuk, Iowa in 1856. Their youngest brother opened another dry goods store in Des Moines, Iowa a few years later. In 1879, the Keokuk store was closed and the Des Moines location became the main store. Twenty years later the Des Moines store was moved to 7th and Walnut Streets, where it operated for 106 years. As with most department stores, it was an anchor for a vibrant downtown and expanded over the years. The Tea Room was opened in the 1920s and often featured a pianist to set mood. The store became a chain when they began opening new stores in suburban shopping plazas and eventually the whole chain was sold to Proffitt's of Knoxville, Tennessee in December 1996. Proffitt’s bought up a number of other department store chains including Saks and Carson Pirie Scott. Younkers became part of their Saks unit, which closed Younkers' headquarters in Des Moines in 2003. The main downtown building, including the Tea Room, was vacated when the store closed in 2005, and all the store furnishings were sold in 2007, including the Steinway baby grand piano autographed by pianist Roger Williams. If you come back in a couple of years, you may be able to eat at the Tea Room once again, as it is currently undergoing restoration to the oak tables and chintz draperies style of its heyday. The department store building suffered a fire in April, 2014 that destroyed about half the building, but the Tea Room portion was spared. Along with the renovations, the main floor will be retail space and the other floors will be converted into apartments, as have many older Des Moines buildings. Oh, and in case you’re wondering how Roger Williams came to autograph a piano here, he was a native of Des Moines. You probably recognize the name from his 1955 “Autumn Leaves” the best-selling piano solo record of all time and the only one ever to reach the top of the Billboard charts. He was known as the "Pianist to the Presidents", having played for nine administrations. His birth name was Louis Weertz, and Roger Williams was a stage name created when signed a recording contract with Kapp Records in the early 1950s. He recorded three albums for Kapp in 1962, but his most recent hit single that we would have listened to on the radio was “Yellow Bird” from 1961. That was a favorite of my dad’s. Anyway, we need to find somewhere else for lunch today. How about the cafeteria on the ground floor of the Iowa State Capitol? That’s an unusual venue that has been around since before 1962. Maybe you’ll get to shake hands or corner a legislator with a question. Looks like they serve a typical soup and sandwich fare, with menu items like pulled pork sandwiches and cheesy cauliflower soup. Menus vary by the day of the week, I hope I’m here on a tasty day. If you’re not into public building cafeterias, you might find some place interesting to eat just a block or two west of the Capitol. The East Village is Des Moines’ most vibrant and diverse downtown district, but it looks to me like mostly new occupants of old buildings. On my way to the Capitol, I’m following highway US-69 north on East 14th Street. The route was here in 1962, and still is today. Route US-69 today runs 1136 miles from Albert Lea, Minnesota to Port Arthur, Texas. It was once five miles longer but really has not changed much since 1962. It’s mostly a rural route: the only really big metropolitan area it crosses through is the Kansas City area at the Missouri-Kansas border. One landmark is the Eisenhower Birthplace State Historic Site in Denison, Texas, which has been open to the public since 1946. The Iowa State Capitol’s 23-karat golden dome towers above the city and is complemented by four smaller copper-covered domes at each corner of the building. The building was completed in 1886, while the dome has been regilded 4 times, once in 1965, so it probably looked like it needed work in 1962. It is the only five-domed capitol in the country. The Capitol houses the governor's offices, legislature and the old Supreme Court room. One of the stranger features is the pair of statues at the base of the Grand Staircase. These statues were originally commissioned for the Illinois Statehouse, but went unused and were later donated to the state of Iowa. Public tours of the building are given, and visitors can see the Grand Staircase, Edwin H. Blashfield’s mural painting “Westward” at the east wall of the staircase, the 67 foot diameter rotunda, and many parts of the first and second floors. The Iowa Constitution is on display in the office of the Secretary of State. The State Capitol Law Library is an awesome room, looking like a fantasy magician’s library with spiral stairways and balconies surrounding its four floors of books. If you can’t get to Iowa, they offer a virtual tour online. Outdoors, there are various monuments and memorials, including the Soldiers and Sailors Monument, the Lincoln and Tad statue, and a replica of the Liberty Bell. This Liberty Bell was presented to Iowa in 1950 by the U.S. Department of the Treasury, to thank the state for its efforts in the previous 10 years’ war-bond drives. LOOK Magazine subscription building, Des Moines, Iowa, on circa 1960s postcard (from Cardboard America, used by permission). Just before lunch, I mentioned that many older Des Moines buildings have been converted to apartments. One such building is the LOOK Magazine subscription building. In addition to Better Homes & Gardens, another popular magazine of the 1962 era was published here: LOOK. The editorial offices were in New York City. At some point in the early 1960s, the magazine had more than 7,600,000 copies of paid circulation, so this building was busy! LOOK was another of the general interest, large-format magazines’s popular because of their photo articles. Circulation was second only to Life and ahead of The Saturday Evening Post and Collier's. LOOK was a publication of Cowles Media, which was founded here in 1935 by Gardner "Mike" Cowles, Jr. and his brother John Cowles. Cowles also owned KCCI television here in 1962 and purchased Family Circle Magazine that year. Family Circle eventually ended up with the Meredith Corporation, the publisher of Better Homes & Gardens. LOOK Magazine stopped publishing in 1972, having outlasted Collier's (1956) and the Saturday Evening Post (1969). Their other major competitor, Life Magazine, is still published, but it ended its weekly status in 1972. The LOOK Magazine Photograph Collection was donated to the Library of Congress and contains approximately five million items. There is also a remnant business here, founded by a group of LOOK Magazine employees. When the magazine folded, this group built an order and subscription fulfillment system around the LOOK system and are still in business as CDS Global. It’s now the top fulfillment provider to the magazine industry in North America for both print subscriptions and digital authentication, and is still based in Des Moines. The building was renovated into upscale loft housing in 2004. I’m going to stay parked right where I am and walk a few blocks over to the Iowa State Historical Museum. The museum is operated by The State Historical Society of Iowa, an arm of the state government. It was founded in 1892 and moved to a new building in 1899. The museum outgrew that site after almost a hundred years, so the building we see today was constructed in 1987. Exhibits include one that a map buff like myself is glad to have a chance to see. The historic Rand McNally Globe was made of spun aluminum by mapmaker Rand McNally in 1949. Rand McNally staff hand-painted the globe, which measures 6 feet in diameter and weighs 150 pounds. It was installed in the lobby of the Des Moines Register & Tribune Company in 1950 to commemorate 100 years of their publishing. The globe was there for 63 years, so we would have had to stop into the newspaper offices to see it in 1962. The newspaper donated the globe to the Museum in 2013. Besides the usual history exhibits, today you can take an hour-long, behind-the-scenes walking tour explores the museum’s “vault”. The “vault” is an underground, climate-controlled preservation center that is home to more than 100,000 artifacts collected by the museum during the past 120 years. It should offer a good chance to see things that may have been on display in 1962 but are not out today. If you come to Des Moines in mid-August, you will have a chance to see the Iowa State Fair. This fair is the single largest event in the state! It’s also one of the largest agricultural and industrial expos in the country, annually attracting over a million people. The fair is even the only fair listed in best-selling travel book, “1000 Places to See Before You Die”. So, maybe you should plan on being in Des Moines in mid-August. Even if you’re here some other time, the fairgrounds hosts a number of other agricultural and entertainment events during the year. The first Iowa State Fair was held in Fairfield, Iowa, 1854. It then moved around from place to place in the state, landing in Des Moines in 1879, and has remained here since. The fair has been in its present location on 450 acres since 1886. It was the inspiration for the novel “State Fair” by Phil Stong, and the three movies and Broadway musical of the same name. There are hundreds of displays, of farm products, farm animals, commercial products, and 4H and other prize-winning exhibitions. I’m not sure why they were absent for some years, but the fair of 1961 marked the return of major machinery exhibitors, so we could have also seen the farm machinery in 1962. Of course, we could also have enjoyed the tasty foods served at the fair, though today’s choices are more numerous than we would have found back then. Today, 60 foods are served on-a-stick! Many specialty foods are served by agricultural organizations who want to make sure you buy more of their products. For example, the diary producers have awesome milk shakes, the turkey growers serve a giant BBQ turkey breast sandwich, Iowa Pork Producers offer a pork tenderloin sandwich, and you can get fresh ears of corn! Even popcorn is smothered in "Pride Of Iowa" real butter. Speaking of butter, don’t forget to see the annual sculpted butter cow. Up until 2006, it was sculpted by Norma “Duffy” Lyon, who took over the project in 1960, becoming only the third person to do so. We would have seen her work in 1962 and just a few years ago. All this and a great midway of rides too! Unfortunately, it’s November and not August, so no Iowa State Fair for us. However, we could stay to see a concert: many big name acts perform here. But this afternoon, my wife and I will be stopping in to the Iowa State Pigeon Association’s 89th Annual Show. She likes the specially bred varieties of birds, with colorful plumage, feathers on their feet, and other standard bred fancy pigeons. Later in the year you can find a Diecast Toy Show, which might have toys from 1962, or an antique show. And these are just a few examples of the events that you can find at the fairgrounds throughout the year. It’s getting late in the day now, so it must be suppertime. How about an Italian dinner? Tursi's Latin King Restaurant has been here since 1947, so it fits our age requirements. The sign on top looks like it has been here since then, though much of the building is newer. While the name made me think Mexican at first, the courtyard says Italian. It actually reminds me of a restaurant I visited outside of Rome, Italy. And if you’re interested in wines, they specialize in Italian wines, including one by the Tursi family’s relatives in the old country. I’ve never had toasted raviolis, which seems to be a specialty here, so that’s what I will have for dinner. Hope they have a good cup of espresso for desert! If this were really 1962, I would propose spending the rest of the evening at Riverview Amusement Park. This was a Des Moines fixture from 1915 to 1978, but is only a memory now. As was common with many amusement parks between 1900 and the 1920s, Riverview began as a trolley destination. It was located on an island and also originally included a zoological garden. The park added amusement rides and other attractions over the years, becoming a real amusement park like the early Cedar Point, which we saw back on Day 15 of our US-6 roadtrip. A sampling of the rides, which were not all here in 1962, includes a Ferris Wheel, carousel, miniature train, Junior Hot Rods, Umbrella Ride, kids rides like the Skyfighter and Kiddie Boats, Shoot the Chutes, Wild Mouse, and Dodgem cars. Other attractions to keep you busy spending money were the miniture golf course, trained animals at the I. Q. Zoo, midway games, a shooting gallery, a Mirror Maze, and the Penny Arcade with Laffing Sal, a mechanical clown that was retired in approximately 1962. And of course there was a roller coaster. The coaster at Riverview Park was here for around for 58 years, replacing a coaster that burned down around 1919. It was originally named "The Aeroplane" but became known simply as "The Coaster". Real speedboat rides were given for many years on the lagoon! The Riviera Ballroom was added in 1940 and hosted big band dances throughout the 1940s and 1950s, followed by teen dances in the 1960s and 1970s. In 1957, the Harris Hop began. This was a weekly dance hosted by local TV and radio personality, Lee Harris. Dances at the Riviera not only presented the best of local bands, but also nationally known talent. Bands familiar to Iowans included Dominic and the Dominoes, The Cavaliers, The Spartans, The Pendletons, The Road Runners, The Echoes, The Novelles, The Missing Links, Tommy Tucker and the Esquires, The Pete Klint Quintet, Sir Richard and the Squires, The Rhythm Masters, and The Pelican Peace Band. In 1948 there were only 420 amusement parks nationwide, but that had grown to over 700 just 10 years later. All those baby boomer kids really filled up the parks! When Disneyland opened in 1955 to amazing success, corporate sponsored theme parks started springing up all over the country. Unlike Cedar Point, which found new investors and transformed itself into a Disneyland style amusement park, Riverview never made the transition. Smaller, traditional amusement parks could not compete with the new theme parks and many closed around the country. A new theme park, Adventureland, was opened in the Des Moines area in 1974. The new park was successful enough that it made an offer to buy Riverview after the end of the 1978 season. The sale was completed in spring of 1979 and the new owners closed Riverview. All the buildings and rides have since been demolished, leaving a largely empty island in the lagoon. We can enjoy a short visit to Riverview Amusement Park in this video, which seems to be in the 1960-1964 period. After that, I’m retiring for the night and will see you tomorrow on Roadtrip-’62 ™ .